The Outhousers Feature Radical's Damaged #2 Contest | Radical Studios, Inc.Radical Studios, Inc. Comic in shops, contest online! Following its August debut, Damaged, Radical’s thrilling new crime drama, continues. Don’t miss the next chapter in the Damaged saga, in stores NOW! Damaged is produced by Sam Worthington (Avatar), created by Michael Schwarz and John Schwarz, illustrated by Leonardo Manco and written by Eisner Award-winner David Lapham. 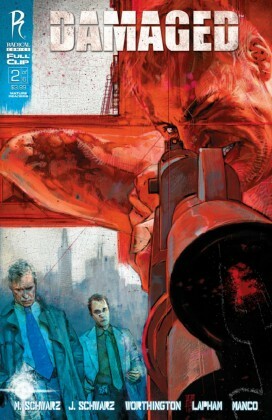 In Damaged#2, the paths of long-estranged brothers Frank and Henry Lincoln finally cross. Frank, who has spent his life becoming a respected member of the San Francisco police force, is approaching retirement, investigating one last case with his young replacement. Meanwhile, Henry, a vigilante whose vision of justice is far darker than the law allows, has finally returned to his native San Francisco, his sights set on training a troubled former police officer to follow in his footsteps. Sparks fly as the two brothers and their differing visions of justice collide—and the fate of the city may hang in the balance. Don’t forget to ask your local retailer about finding this book at a store near you! After the success of a recent contest surrounding the release of Driver for the Dead in trade paperback, Radical has decided to throw another celebratory contest around Damaged#2, the next chapter in the highly-anticipated Damaged saga. #Damaged from @RadicalComics is on sale now! Ten winners will be selected randomly at the contest’s conclusion. These winners will receive complimentary copies of Damaged issues one and two along with a rare, limited edition lithograph, numbered and signed by writer David Lapham and series creators Michael and John Schwarz. These lithographs feature cover artwork by Alex Maleev and will be produced in a highly limited edition of ten, so don’t delay—this is your chance to win! Click here to go to this article at TheOuthousers.com or click the image above to learn more about Damaged.